I spent an hour in my chair by the window this morning working in my writer's notebook. It is a regular routine of mine, and it helps me work out lots of thinking so that I can write better. In the bookshelves behind the desk in my office are stacks of notebooks from the past. 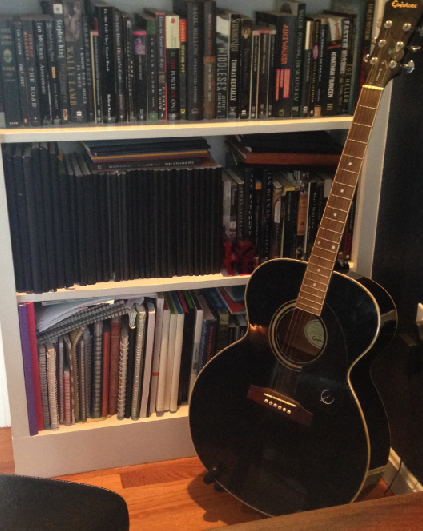 You can see them next to my guitar in this photograph. You can also see how my notebooks have changed over time. I used to always use a spiral bound notebook (bottom shelf) and now I almost always have a black cover, lined-paper-inside notebook. One notebook lasts about 3-4 months, so there are even older notebooks in other places in my house. I remember writing in one of them as a 12-year-old--when I wrote mostly about boys and basketball. but now I use felt tip pens like the one on the bottom right of this picture because ink cartridges have been a problem on airplanes and I travel a lot. (Sometimes the air pressure makes ink cartridges leak all over me and once the security people took them out of my luggage because they said they looked dangerous.) I always travel with a small pack of pens and colored pencils so I can work anywhere. Here is something I was working on recently. It's a map of my neighborhood where I grew up in Portland, Oregon. My high school students are writing practice responses to college admissions essay questions and one question asks about a favorite place. I drew mine and they worked on theirs and then we all chose one place on our map to write about. From this map you're looking at I wrote the story of riding my bike to play tennis every morning with my friends. But there are lots of stories on this map! Every time I draw one with students I find more stories to tell. Try this. You could play with the voice of who tells the story... what would your dog say? How would your best friend tell the story of your bike-riding adventure? Notebooks are the perfect place to try things out as a writer. My writing notebook is always with me. It holds the lists of books I've been reading and the thinking I am doing as I read. My notebook has photographs and concert tickets and sketches I draw of things and people I love. My notebooks is filled with the words of writers I admire. It is a place to practice my thinking and to tell the stories of my life. 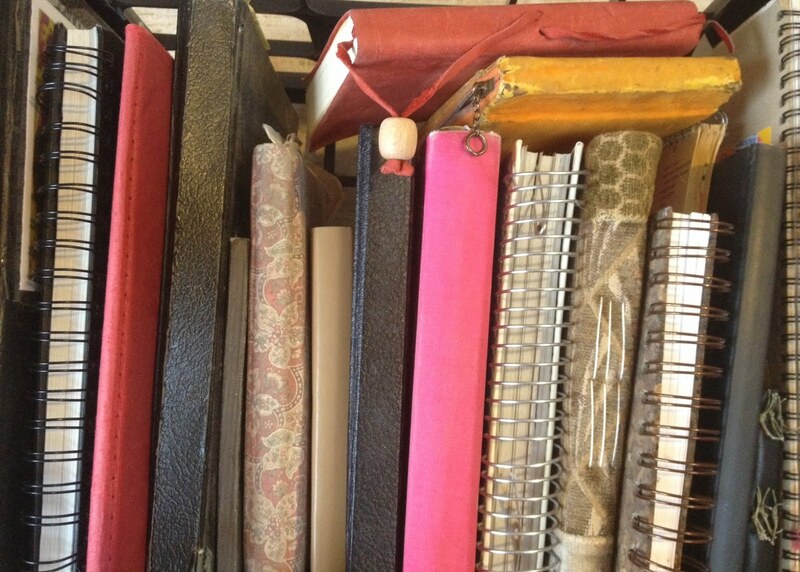 Every one of my books has been written mostly in a notebook first. It's where I grow into the best writing I can do. 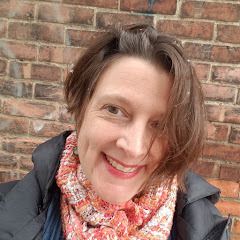 Penny and Heinemann have generously offered copies of MY QUICK WRITES, Penny's book with Donald Graves, for two commenters on this post. Please leave a comment by Monday, November 24 to be entered into this drawing. I love this look inside your notebook, Penny! Have you ever seen Lee Ann Spillane's? It's a work of art, I swear. Can't wait to see your new book! This is so neat! I especially love the map. I love the glimpse into your notebook, thank you! I love the map and seeing your notebook. I can't wait to see your new book. Thank you for sharing this glimpse into your writing life! Thank you for this fabulous piece! 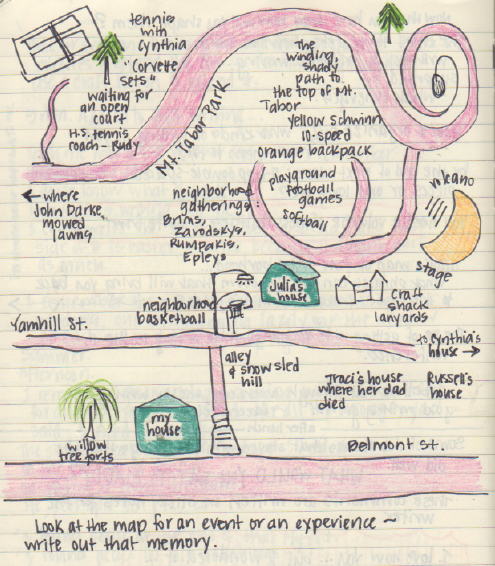 I can't wait to draw a map of my the neighborhood where I grew up to see what memories it stirs up. Thanks for this glimpse into your writing life, Penny. 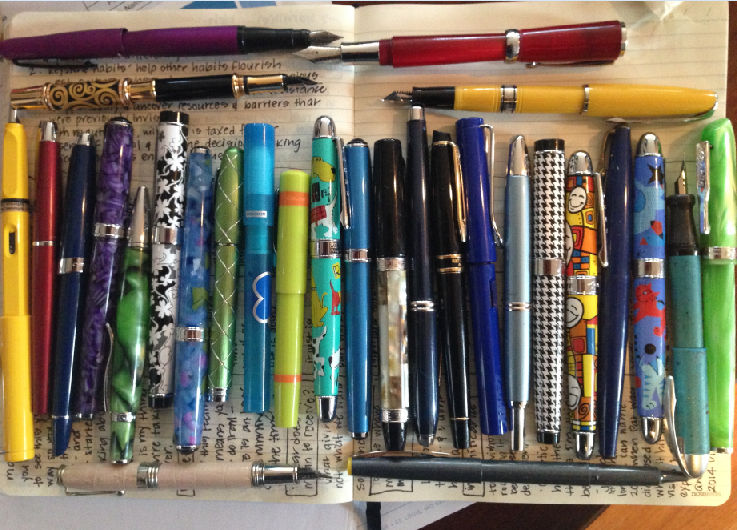 Your pen picture reminds me I have many, many pens. You've inspired me to go back to my composition notebook. I love taking a glimpse inside other writers' notebooks. This is a treasure. Thank you for posting! It's so great to get another glimpse into one of Penny's personal notebooks. I'm a high school English teacher, and I've been using notebooks like these in my English classes since reading Penny's outstanding book, WRITE BESIDE THEM. It completely changed the way I teach writing. My students' notebooks blow me away every year! Love this. I have students who turn their writing notebooks into works of art, too. I recently read "A Map of the World: The Works Accirding to Artists and Illustrators," which has given me a whole new perspective about mapping to write. Love seeing how other writers think and work! Thanks for the view. Sure wish I could have had you as a teacher! I love how you said that when you were 12 you wrote about boys and basketball. It's nice for students to know that grown up writers didn't always write beautiful essays and deep haikus in their notebooks. Writing is writing. Love this post! I was lucky to see one of your notebooks when you presented at Kent Reading Council. 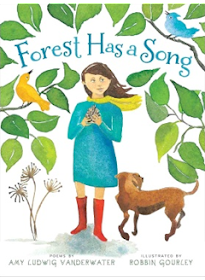 Loved the colored inks, sketches, and how the words wound round the pages. Maps bring stories to life of things I've totally forgotten. Are you still wearing your glasses? I always love the glimpses into notebooks. Thank you. 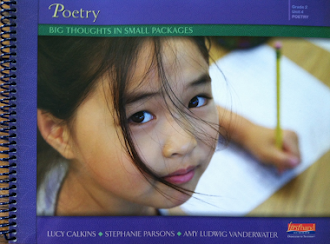 Will use some parts with my 4th grade writers.